Using a new, exciting and amazingly simple technique, this self-taught scientist may be helping to solve the world's energy crisis. It is dusk as I arrive at the Domaine des Ternpliers, a 241-hectare timber tract backed on to the Alpes de Provence. Driving over a bumpy mud road that snakes across a barren moor near Villecrore, I come upon a big white house, home of Jean Pain, a 51-year-old Frenchman. Until recently, Pain was an unknown. Today, he's hailed as "the king of green gold," and energy experts from all over the globe have come to Domaine des Tenipliers to study the miracle Pain has wrought: an amazingly simple, and incredibly inexpensive system that extracts both energy and fertilizer (gold) from plant life (green). These scientists are hopeful that Pain's new process will go a long way in helping overcome the worldwide shortage of fuel. Says Andre Birre, author of Humus: Wealth and Health of the Earth, concerning the Pain method : "We are so hypnotized by the black gold we call oil, of which the supply is limited, that we fail to see that everyone can exploit that other gold-humus-not only without exhausting the supply, but constantly increasing it." I knock on the door and am greeted warmly by Jean Pain and his wife, Ida. Jean, I notice, has a wrestler's build and a hermit's calm. He accompanies me to about 50 metres from the front door and shows me the object of the world's attention -- a home-made power plant that supplies 100 per cent of the Pains' energy needs. What I see is a mound, three metres high and six across, made of tiny pieces of brushwood. This vegetable cocktail, Pain explains, made of tree limbs and pulverized underbrush, is a compost, much like the pile of decaying organic matter that people build in their gardens, using food scraps and leaves. Buried inside the 50-ton compost, he says, is a steel tank with a capacity of four cubic metres. It is three-fourths full of the same compost, which has first been steeped in water for two months. The tank is hermetically sealed, but is connected by tubing to 24-truck-tyre inner tubes, banked nearby in piles. 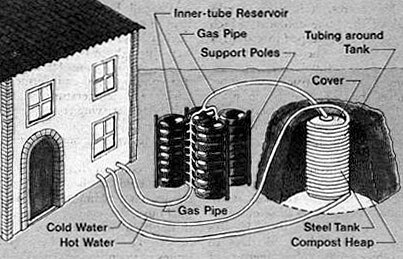 The tubes serve as a reservoir for the methane gas produced as the compost ferments. "Once the gas is distilled, washed through small stones in water -- and compressed," Pain explains, "we use it to cook our food, produce our electricity and fuel our truck." He says that it takes about 90 days to produce 500 cubic metres of gas -- enough to keep Ida's two ovens and a three-burner stove going for a year. Leading to a room behind the house, he shows me the methane-fuelled internal combustion engine that turns a generator, producing 100 watts every hour. This charges an accumulator battery, which stores the current, providing all the Pains need to light their five-room house (just like in Electricity - Make it, Don't Buy it). As Ida drives off in their truck, I see on the roof two gas bottles shaped like long cannon shells. These have a capacity of five cubic metres of compressed gas, allowing her to drive 100 kilometres. Jean says that ten kilos of brush-wood supply the gas equivalent of a litre of high-test petrol. All that is needed to use it as motor fuel is a slight carburettor adjustment. We walk back to the compost. Jean points to a 40-millimetre-thick plastic tube that runs from a well, through the heap and on to a tap inside the house. He explains that compost heats as it ferments, raising the temperature so that cold water, arriving from the well after passing through 200 metres of tubing wound round the tank, emerges at 60 degrees C. I personally confirm that the water arrives cold at the "cake" and comes out scalding. Once inside the house, the hot water circulates through radiators and heats the house. The compost heap continues fermenting for nearly 18 months, supplying hot water at a rate of four litres a minute, enough to satisfy the central heating, bathroom and kitchen requirements. Then the installation is dismantled and a new compost system is set up at once to assure a continuous supply of hot water. The inert, brushwood compost now provides Pain with still another use. Once fermentation ends, the big, magic cake produces no more energy, but it will still render 50 tons of natural fertilizer. By spreading a layer of this humus on the poor, stony soil around the house, Jean Pain has created a luxurious farm garden where even tropical vegetables grow. I admire tomato plants two-and-a-half metres high, lift a six-kilo watermelon and inspect a chayote (a kind of sweet Zucchini -- hitherto found only in the West Indies and in Africa), What surprises me most is that these giant vegetables need no watering; all the water they require, Pain tells me, is synthesized in the compost. The ingenious power-plant Pain has developed and built with his own hands took 15 years of tireless effort. lt all started while Pain was gathering brushwood and noticed that wherever it was found the vegetation underneath seemed to grow more abundantly. The reason, he learnt, is that as branches, leaves and shrubs decompose they form the nutritious humus that enriches the earth. To imitate nature and produce humus, he thought, we could trim excess undergrowth from the forests. Then perhaps we could capture the energy produced by the fermentation that transforms this brushwood into humus. Jean Pain has no diploma; but he is intelligent, highly adaptable and keenly observant. And starting in 1965, be devoured dozens of books on science while carrying out his first experiments. He began by fermenting the brushwood cuttings as he brought them in, but soon realized that fermentation would be more efficient if the bigger boughs were chopped up as finely as possible. No machine for this existed, so he invented one, building it in his garage with salvaged material. The potential significance of Pain's discovery is enormous. What it means, to Pain, is that forests can become twenty-first-century man's "guardian angels." The stakes for France are obviously high. While the French import 126 million tons of oil annually, throwing their balance of payments seriously off the mark, French forests constitute an energy back-up with a potential that biologist Robert du Pontavice estimates as equivalent to 20 million tons of oil. Nor are these merely "theoretical" and unexploitable resources. Pain has taken the costs of his method into account. He has gone over and over his calculations and the figures are there: 1,000 hectares of forest can supply 6,000 tons of fertilizer a year, 960,000 cubic metres of biogas (or 480,000 litres oil equivalent) and millions of litres of hot water. And exploiting the forest costs only 12 per cent of the energy extracted from it. What's more, the cycle can be repeated indefinitely as brushwood is renewed every seven years. Thus, not only would the forest remain clean and free from the danger of fire, but would provide an inexhaustible supply of fertilizer and thermal energy. Already in France and throughout the world, many uses are being made of the techniques Pain developed at the Dornaine des Templiers. In France, eight municipalities have chosen to adopt his techniques for recycling vegetation and supplying heat and hot water to public buildings, hot-houses and sports facilities. "In Sainpuits, a village of 500 inhabitants, we heat several buildings with the object of proving the value of the system," I was told by Etienne Bonvallet, project foreman of the pilot operation. In the Savoie, Chambery began to use Jean Pain's method in January 1980. A 200-cubic-metre compost bed, made of broken wood from plane trees and lime trees, will supply 23,400 kilocalories an hour and heat a 200 square-metre hot-house. Within two years, it will be possible to salvage 80 cubic metres of humus for the community gardens. Says Henri Stehle, internationally respected agriculture expert and botanist and Institute of France prize-winner, "At the end of the path Pain has opened, stands tomorrow's self-sufficient agribusiness producing its own fertilizer and the power to run its equipment." Pain's methods are beginning to spread to the rest of Europe. In Brussels, Belgium, stands a compost plant and a flourishing garden. This is the experimental station of the International Jean Pain Committee, formed in 1978 by Frederik Vanden Brande, former Belgian secretary-general of the Council of European Townships, to publicize Pain's techniques. This station is the showcase of the Jean Pain committee, and its pride. But the committee has many other activities. It puts out brochures, gives lectures, and organizes twice yearly, two-week training programmes where 100-odd farmers, students, and environmental specialists from various parts of the world study grinding, composting, and methane production procedures. Both in France and abroad, Jean Pain's methods are destined to be applied over a wider field. Pain has devoted followers in Australia, the United States, Tunis, Latin America and Japan. 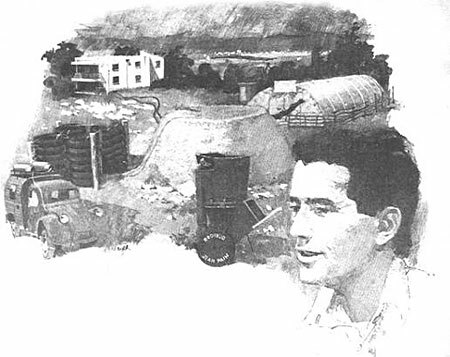 International energy expert Robert Giry, author of Is Nuclear Energy Useless?, predicts: "In our times of crisis, with European agriculture in danger of one day suddenly finding itself deprived of energy, the path opened by Jean Pain for the production of fertilizer, fuel and electricity could lead to a brimming future." The simplest principles often underlie the most useful discoveries. Now, when soil exhaustion and the search for new energy sources are the leading brain-twisters in the developed societies, Jean Pain, the self-taught scientist with calloused hands, offers a commonsense solution: the green gold that's to be found almost everywhere in the world. It is here, under our feet; we have only to stoop down to gather it.